I never thought I’d be thinking about Jesus during a Tom Cruise movie, but it happened. The movie? MISSION: IMPOSSIBLE - FALLOUT. [Spoiler Ahead] - It’s okay though, I only give away one of the earlier twists in the movie. Basically, a bunch of nukes have been stolen (aren’t they always?) and Ethan Hunt (Tom Cruise) has to track them down before they are detonated. In the process, he has to interview a Russian nuclear weapons specialist who refuses to give Hunt an important code that will help him access an oh-so-important laptop with some more important stuff on it. The nuke specialist will only do it if Hunt can get a manifesto about “no-peace-without-suffering” read live on CNN. Hunt threatens. Nuke specialist holds his ground. Hunt concedes, and within moments, Wolf Blitzer is on air reading the manifesto, live. During the broadcast, we find out that the nukes have already been detonated in Jerusalem, The Vatican and Shanghai. The nuclear specialist feels satisfied and gives Hunt the code. But voila! All is not as it seems. Once Ethan and his IMF crew get the codes, the walls of the hospital literally fall back and we see a makeshift studio in the background with a fake news crew filming Wolf Blitzer. The news footage of destroyed cities was also a fake. [Yes, I see the irony]. Turns out, Hunt had the whole scene staged and was in control of the reality the specialist was experiencing the whole time. What seemed like chaos and disorder (to the specialist), was in fact, a well-orchestrated plan designed to accomplish a predetermined end goal. Well, you simply need to step into the Garden of Gethsemane on the night of Jesus’ arrest and you’ll see the connection. By any account, that was a rough night for Jesus and His followers. An armed mob has surrounded Him with every intention of doing great harm that will eventually lead to His death. Yet, not once do we see Jesus break into panic mode. If anything, He seems to be the one calling the shots every step of the way. Perhaps even more incredible is the fact that in the midst of all the pandemonium, He seems to slow down the reel long enough to heal one of the very people who had come to kill Him. Incase you don’t have a lot of Bible background, I am referring to the miracle where Jesus heals the chopped off ear of the High Priests’ servant, a man named Malchus (John 18:10-11). Before I walk you through this event, let me plant in your mind this central idea so you can see it unfold as we journey through that night. EVEN WHEN LIFE SEEMS OUT OF CONTROL, JESUS CHRIST STILL CALLS THE SHOTS IN YOUR LIFE. He’s as cool and in control of the scenes in your life as Ethan Hunt was in the scene described above. 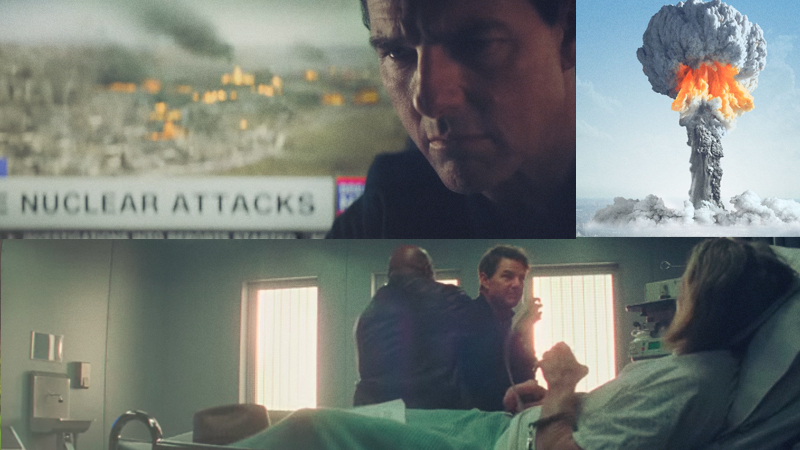 (You can forgive me later for comparing Jesus to fake Tom Cruise), but based on the events that took place on the night of Jesus’ arrest, there are at least three ways Jesus is kinda like Ethan Hunt. To be clear, I’m exegeting scripture here, not MISSION: IMPOSSIBLE FALLOUT. Allfour Gospel writers capture the unfolding events of Jesus’ arrest, so we’re getting many perspectives on this one fateful night. (JESUS POSITIONED HIMSELF EXACTLY WHERE HE WANTED AND NEEDED TO BE). John 18:1-4 says, “When he had finished praying, Jesus left with his disciples and crossed the Kidron Valley. On the other side there was a garden, and he and his disciples went into it. 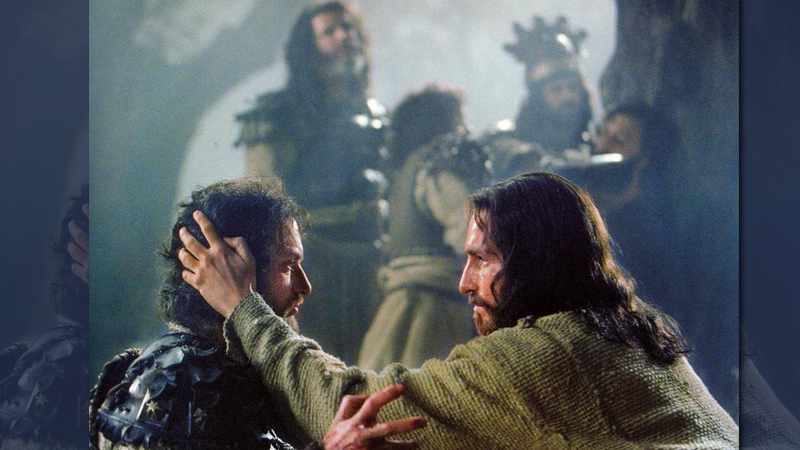 Now Judas, who betrayed him, knew the place, because Jesus had often met there with his disciples. So Judas came to the garden, guiding a detachment of soldiers and some officials from the chief priests and the Pharisees. They were carrying torches, lanterns and weapons. One of the basic rules of counter-terrorism (which ironically, was developed in the Middle East) is to vary your routine and your schedule. Yet, on the night of Jesus’ arrest, His actions suggest He was deliberately setting Himself up to be caught. When verse 1 says thatJesus headed to a garden across the Kidron Valley, understand that this was an act of omniscience. He was knowingly placing Himself at the precise location where God’s pre-ordained plan would begin to unfold (Acts 2:22-24). So, here again, we see Jesus knowingly positioning Himself for what is to come. He knew that Judas had already aligned Himself with Satan. It’s why He “released” Him to go put in motion His betrayal plan.It’s also why He would later head to the precise location in the Kidron Valley where He knew Judas would bring the authorities to come find Him. By the way, it’s for this same reason that several assassination attempts on Jesus’ life failed (John 8:59; Luke 4:28-30; Matthew 26:3-4; John 5:18-19). They all failed because Jesus was on no man’s time table, but on a predetermined schedule set by the Father in heaven (Acts 2:22-24). For followers of Jesus Christ, what may sometimes appear in your life as sudden and out of control, is many times God’s way of positioning you exactly where you need to be in that season of life. Remember: EVEN WHEN LIFE SEEMS OUT OF CONTROL, JESUS CHRIST STILL CALLS THE SHOTS IN YOUR LIFE. (JESUS COULD HAVE EASILY OVERPOWERED THE ARRESTING OFFICERS AND SOLDIERS). This security force is a big group! 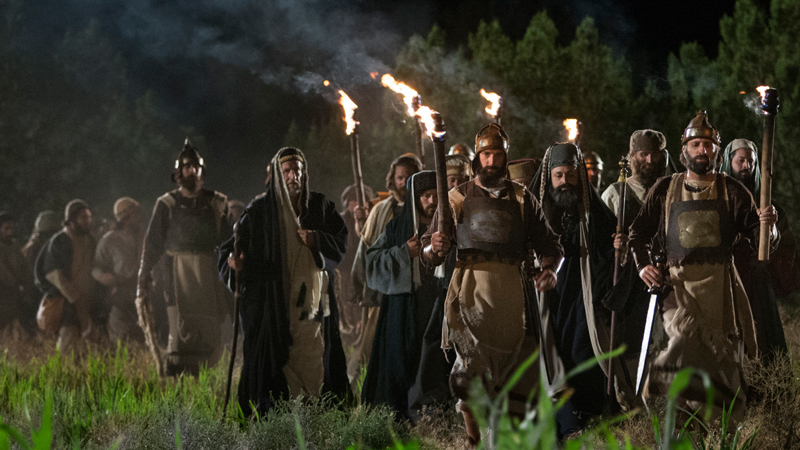 It includes Jewish temple officers who are carrying clubs as weapons, and they’re being led by the servant of the high priest, a man named Malchus (who’s a key player in this story).This large contingent also includes a detachment of Roman soldiers (a cohort), which is made up of at least 500-armed men, all carrying swords. Needless to say, this is an intimidating crowd! In addition, they are carrying lanterns and torches,which means, these guys have come ready to break down some doors because they’re expecting a fight. In their minds, they believed that Jesus would need to be taken by force, or that He’d be hiding and they’d need to search Him out in the dark and capture Him like Seal Team 6searching for Osama Bin Laden. So they are not expecting what is going to happen next. My point? Jesus is not simply identifying Himself to this security force - THIS IS A DECLARATION OF HIS DEITY!He is giving them a brief, fleeting revelation of His divine power.You might recall from Revelation 19:15 that in the future when Jesus returns, the words coming out of His mouth are going to be like “…a sharp sword with which to strike down the nations.” These dudes just received a small dose of the impact of the sword! It’s this display of divine power in His words that causes a group of armed men to “…draw back and fall to the ground” (verse 6). Here’s the implication of this truth for your life. Sometimes God WILL NOT deliver us out of those unexpected difficult trials we experience in life. Rather, IN THE MIDST OF IT, He simply gives us a deeper revelation of Himself where we learn that HE is the answer we most desperately need. Please pause. Read that last section AGAIN. So, in light of this, if you find yourself in a trying season of life, it will prove very helpful to turn down the volume down on all the other distracting noise in your life, prayerfully lean in,and listen closely to hear what God is trying to reveal to you about Himself. JESUS IS IN CONTROL OF EVERY MOMENT OF YOUR LIFE. Now, clearly Peter hadn’t thought this through. This was pure passion without wisdom.First of all, they were way outnumbered, and in contrast to the well armed security force, Luke 22:38 tells us that between the 11 disciples, they only had two swords! Peter was holding one of them and he clearly didn’t even know how to use it because it would appear that he was trying to cut off Malchus’ head, but Malchus ducked and got his ear sliced off instead. What Peter did was dangerous because were Christ not in complete control of the situation, these soldiers would have made no qualms about retaliating and killing everyone around Jesus. In fact, it would seem like that was what was about to happen next, until Jesus, once again exerts His divine authority. It’s here that we finally arrive at the miracle, which, considering the chaotic scene, is quite incredible. Think of what Jesus just did. Malchus is not a friend of Jesus! Malchus works directly for Caiaphas, the high priest, the man at the heart of the conspiracy to murder Jesus! Malchus is the one leading the security force that came to arrest and later torture Jesus! In this moment, Malchus is an enemy of Jesus! Yet, in the midst of this hostile crowd, Jesus extends grace and compassion to Malchus by healing him. Note that it doesn’t say Jesus picked up his chopped off hear and put it back together, no, it says Jesus touched his ear and healed him. In other words, in an instant, “the One through whom all things were created” (John 1:3) fashioned a brand new ear for Malchus so that the searing pain he had a moment earlier was suddenly gone!The deafness he had to have experienced the moment his ear was cut off, also gone! He can hear again! He was healed just as quickly as he had lost his ear, but over a lifetime, would remember the grace, compassion, and divine miracle-working power of Jesus in his life. There’s much to be learned from this encounter, so let me focus on this (sorry, I won’t be saying anything more about Ethan Hunt). For the man or woman who has trusted in Jesus Christ as Lord and Savior, EVEN WHEN LIFE SEEMS OUT OF CONTROL, REST IN THE KNOWLEDGE THAT JESUS CHRIST STILL CALLS THE SHOTS IN YOUR LIFE. Whether your faith in hIM waivers or remains resolute,God has promised in His word that HE will finish and bring to perfect completion the good work He began in you.